The Bengal Warriors are the team that never fails to show grit and determination against all the odds. As the flag bearers of the east, the Bengal Warriors have been associated with the PKL since season one in 2014. The massive Netaji Indoor Stadium is the home ground for the team with a one-of-a-kind atmosphere when a home game is on the cards. Across the five seasons of the PKL, the team has experienced both sides of victory and defeat. It had reached a strong fourth place in the January season of 2016 was followed by a sharp drop to eight places in the June season of the same year. 2017 saw the team bounce back with a strong campaign but their fight ended with defeat at the hands of the Patna Pirates, who went on the win the title in their next match. Birthright Games & Entertainment Private Limited is the current Bengal warriors owner and the management has played the auction to their favour by putting together a team with a great balance of veterans, talented youngsters and lastly, a smart game strategy. 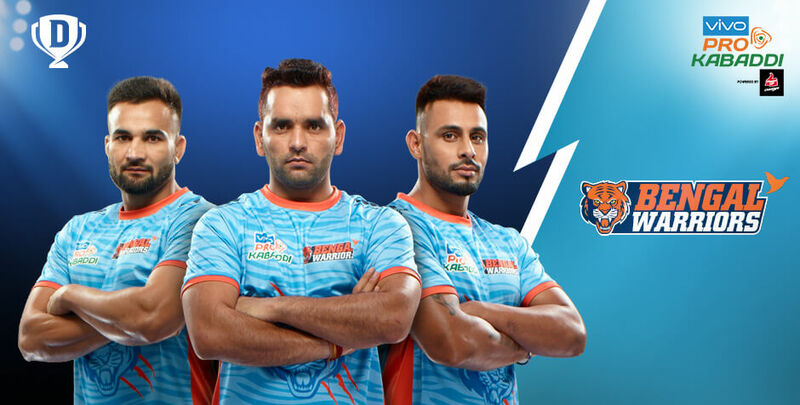 The illustrious list of Bengal Warriors players and their exploits are popular among Kabaddi aficionados and 2018 looks to be a promising year for the Bengal Warriors as they begin their campaign for the PKL title. For those playing PKL on Dream11, here are some interesting statistics and facts about Bengal Warriors that can help you in your strategies. Bengal Warriors captain Surjeet Singh is one of the most unforgiving defenders of the PKL with his signature ‘Dash’ move feared by the best of raiders. With three seasons and over 50 matches, Surjeet holds 17 High 5s to put him in the list of players with most High 5s. Jang Kun Lee of Korea has been retained by the Bengal Warriors since season one and is one of the most successful overseas raiders in the PKL. Jang is also the captain of the Korean national Kabaddi team and his unique mix of martial arts with traditional kabaddi moves proves to be lethal on opponents. Raider Mahesh Goud returns to the team after a season with the U.P. Yoddhas and the champion Patna Pirates team. Mahesh has been part of the PKL since season one and his impressive stats keep him comfortably at the top half of the raiders leaderboard. Maninder Singh is often seen as the ideal kabaddi raider with quick thinking and element of surprise that can leave defenders stunned. He was also part of the title-winning Jaipur Pink Panthers team in season one and is also among the top raiders of PKL. In season five, Maninder Singh finished the tournament as the top raider for the Bengal Warriors. All Rounder Ran Singh is a versatile athlete with tremendous physical strength, his immaculate defence skills and handy raiding experience make him a valuable player to the team. Bengal Warriors are one of the most unpredictable teams as they are known to launch the most lethal attacks at the tail end of the time clock and this puts immense pressure on the opposition. The Bengal Warriors 2018 team is built around an impenetrable defence and a consistent raiding department. Hence, the Bengal Warriors schedule of matches is sure to present many exciting duels and possibly a title contention match! Don’t just be a part of the online chatter, put your sports strategy to the test with Dream11. Make your picks on the Dream11 website or mobile app to select your team when you are on the move. Sharpen your skills and challenge your friends to a duel of your own. Play for fun or take a chance at the big leagues with the various contests and mega contests online on Dream11. Get closer to the coolest PKL online sporting league experience with Dream11 today!